1897-1903 Weekly, semimonthly, weekly New York, NY, then Point Loma, CA. Publisher: New Century Corp.. Editor: Katherine A. Tingley. 1/1, September 30, 1897-6/20 , March 29, 1903. An organ of the Katherine Tingley branch of the Theosophical Society. Noted in Neue Metapsychische Rundschau, June-July 1898, and in Notes and Queries, August 1900. NYPL; California State Library; University of California, San Diego; Yale University Library; Harvard University. San Diego, CA. Publisher: New Century Corp.
6/21, April 5, 1903-January 6, 1907. An organ of Katherine Tingley's branch of Theosophy, most notable today because the issue for August 13, 1905, in an article on "Major-General Abner Doubleday" adds the note: "It is of interest to note the fact that it is to this stanch Theosophist, well-known army officer and author, that the national game of Base Ball owes not only its name, but also in large degree its development from a simpler sport; or, indeed, according to some writers, its very invention." This was the second promulgation of the claim (first made by a man named Abner Graves a few months earlier in an Ohio newspaper) and its publication probably owed much to the fact that Albert G. Spaulding, the sporting goods robber baron, was in the process of trying to establish baseball’s pedigree and was, with his wife, a member of Tingley's Theosophical Society and lived at Lomaland. Doubleday, despite the lack of any evidence to support the claim, was a worthy candidate because he had joined the Theosophical Society in New York in 1878, had acted as its "President Ad Interim" when Blavatsky left for India, and had worked closely with W.Q. Judge, Tingley's predecessor in the American Theosophical Society. 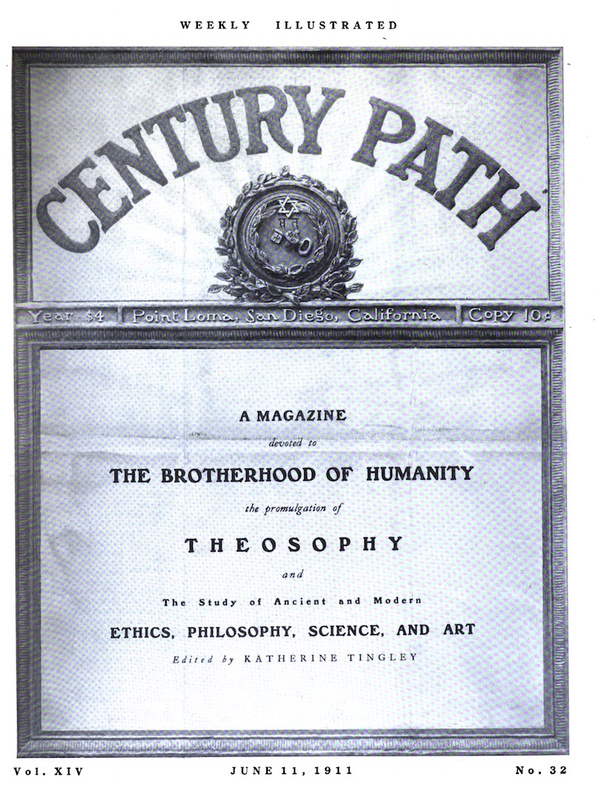 Weekly Illustrated / Magazine Devoted to The Brotherhood of Humanity, the Promulgation of Theosophy and the Study of ancient and modern Ethics, Philosophy, Science, and Art. Point Loma, CA. Publisher: New Century Corp.
10/10, January 13, 1907-14/32, June 11, 1911. 20 pp., $2.00. Organ of Katherine A. Tingley's branch of Theosophy. NYPL; California Historical Society; Stanford University; Yale University; and other locations in OCLC. ZDB: Berlin UB Humboldt.